The Virginia Center for Latin American Art (VACLAA) is looking forward to sharing our corner of the Art Walk - VACLAA on Broad - with the Richmond Kickers, Happy Empanada and Pupusas Skarlet. Our mobile art gallery - Galeria Movimiento - will be on hand and VACLAA will be working with connoissuers young and old to make a large scale painting with rice and beans! Visit our page and like us to learn more about Galeria Movimiento, our educational outreach program, ImaginArte and our Fellowship for Latino Artists- Latino Arts in VA! See you on the corner and on the bus! 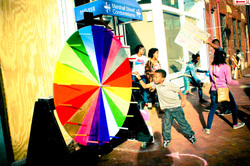 The Wheel of Kindness is an amazing thing dreamt up by the hopeful creative minds at ART 180. ART 180 gives young people the chance to express themselves through art, and to share their stories with others. ART 180 creates and provides art-related programs to young people living in challenging circumstances, encouraging personal and community change through self-expression. So What is the Wheel of Kindness? Well, a person spins the wheel and it lands on a color. You then receive the color of the balloon selected. You can either play with the balloon or pop it. When your balloon pops – there is a message or “Kindness task” inside. You then have to complete the task. Awesome right?